South Korean pop star Rain is facing questions after paparazzi photos showed him out on the town with Kim. Seoul's Defense Ministry said Wednesday, Jan. 2, 2013 it is investigating whether Rain broke military rules by meeting the actress while on duty. For South Korean pop star Rain, all’s not fair in love and war. The R&B singer is facing possible military punishment for meeting with a well-known Korean actress while on duty during his mandatory military service. South Korea’s defense ministry said Thursday that Rain, whose official name is Jung Ji-hoon, met with popular actress Kim Tae-hee at least three times last year. The meetings took place despite rules that forbid the 30-year-old singer from having private meetings when he is off-base on official military business, which — based on his ascribed role in the armed forces — includes recording and performing for the military’s entertainment corps. It may have been more than just the secretive dates — well-documented by paparazzi — that irked military officials: Rain also reportedly violated army regulations by not wearing his military cap when he was off-base. The ministry plans to hold a disciplinary committee meeting next week to decide on his punishment, according to local media reports. As for his liaisons with Kim Tae-hee, Rain’s agents have not confirmed nor denied the romance, but Kim’s management agency admitted that the 32-year-old actress has been dating Rain for a month. All able-bodied South Korean men are required to serve in the armed forces for two to three years. 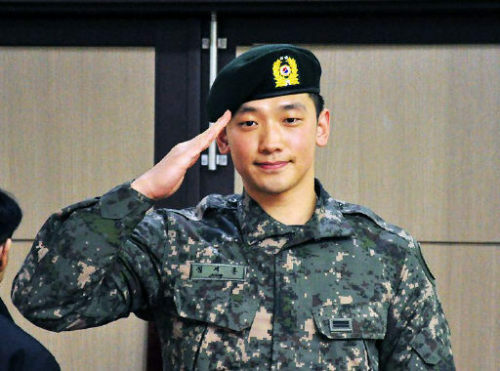 Rain serves as a corporal in a unit that produces TV and radio broadcasts to promote the military. He joined the army in October 2011 and is expected to be discharged on July 10 this year, barring any punishment that might extend his service time.